Being a lifelong Chicagoan, I have heard very positive comments regarding local designer and manufacturer John Van Leishout and his hand-built speakers. For whatever reason, I had never met John or listened to his line of speakers. At the 2013 Chicago AXPONA show, I saw that John Van Leishout's Van L Speakerworks would be featured in Dan Wright's ModWright room. The ModWright room sounded great, and it was quite clear that the Van L Speakerworks Silhouette floor-standing model, retailing for $3,495, was a speaker I would want to review. After having a lengthy conversation with John regarding the overall philosophy of his speaker design, we made arrangements for me to review the Silhouette. The Silhouette is the top-of-the-line speaker in Van L Speakerworks stable and incorporates many innovative strategies that John has been refining for years. The Silhouette employs a unique ambient recovery technology, using dual voice-coil drivers and an additional connection between the speakers to pass the differential information between both speakers. This technology, coupled with very carefully selected parts and many hours of critical tuning by ear, allows the Silhouette to produce a very wide and deep soundstage with a much larger "sweet spot" compared with other speakers. Another unique aspect of the Silhouette is that it uses a custom, proprietary 6.5-inch twin-motor wood cone woofer that loads into a time-aligned transmission line for extended and accurate bass. The other driver is a 1.25-inch soft dome dual-chamber tweeter. 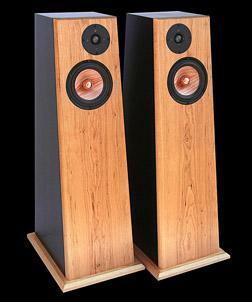 Each speaker weighs 64 pounds and measures 37 inches high by 10.5 inches wide. However, its depth is 15.5 inches, with the base enclosure tapering out from the top plate to the extended base of the speaker. The base is also mounted on four StillPoints spikes. The frequency range is rated at 30 Hz to 30 kHz, +/-3dB. Its sensitivity is 89 dB, and its nominal impedance is four ohms. I auditioned the Silhouette with many different amplifiers, using both tube and solid-state, and all of them easily drove the Silhouette. My audition pair was clad in a handsomely matte cherry veneer with excellent craftsmanship. If your listening room has a traditional motif, the Silhouette's appearance would fit right in. To begin my auditioning, my first musical selection was by Ray Brown, an influential American jazz double bassist, titled "Blues for Junior" from his album Ray Brown-Monty Alexander-Russell Malone Trio (Telarc Jazz). I particularly wanted to see how the Silhouette would handle the space between the players and the tone and timbres of Ray Brown's double bass. The distance and space between the individual players were quite good, with enough air around each of the players to create an illusion of the trio in real space. For a relatively small two-driver speaker, the extension, weight, and tightness of Ray Brown's bass playing performed superlatively. In my opinion, this was because of the use of the transmission-line strategy to increase extension and still allow the woofer's speed and accuracy to shine through. My next musical selection was the song "Gee Baby Ain't I Good to You" by the late, great big-band blues singer Jimmy Rushing, from his album The Scene Live in New York (HighNote). The Silhouette provided a relatively large and spacious soundstage, with Jimmy Rushing centered between the band members. In comparison with my Lawrence Audio Cello Speakers that are triple the price of the Silhouette, I would like to note a very slight shortcoming of the Silhouette speakers: Jimmy Rushing's voice was not quite as three-dimensional as I'm used to hearing on this recording. The last recording I used for my auditioning was Brilliant Corners (JVC) by the Bill Holman Band, to see how the Silhouette would handle the timbres/tonality and high-end extension of a large brass and woodwind section. The Silhouette's take on the middle register of both trumpets and saxophones was very natural and realistic. The high-end frequencies were sweet and detailed enough that you could hear the decay trails quite easily. The high-end of the Silhouette is quite good; however, it falls slightly short of the resolution that speakers that use ribbon or AMT drivers provide in this part of the frequency spectrum. Read on to Page 2 for the High Points, Low Points, Comparison and Competition and Conclusion . . .